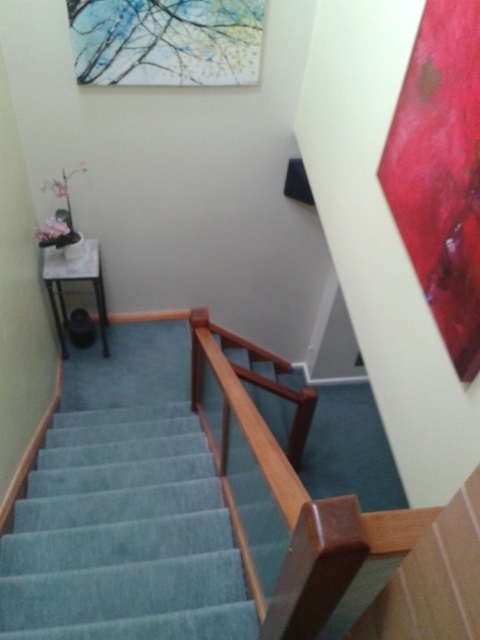 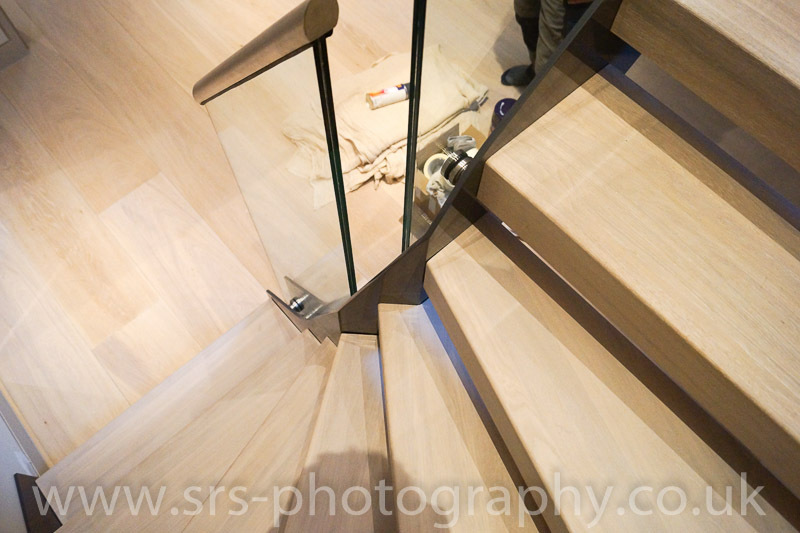 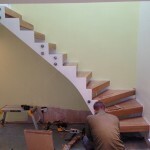 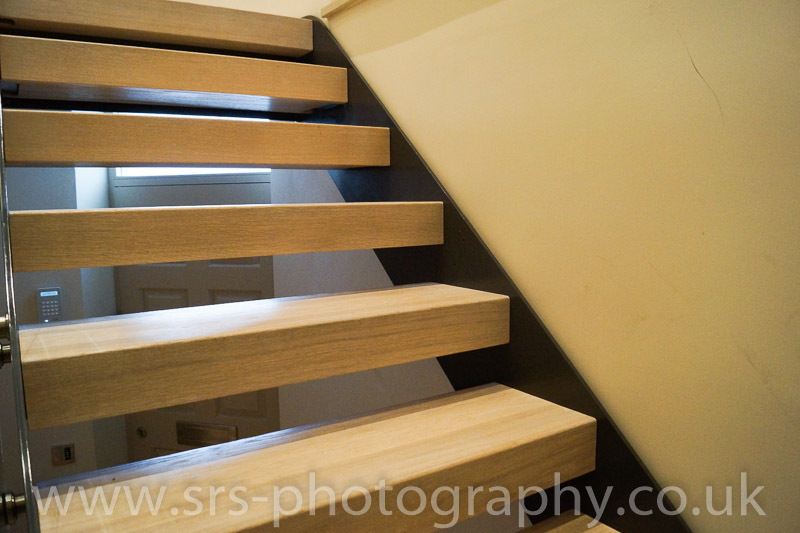 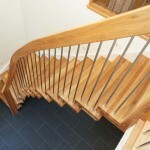 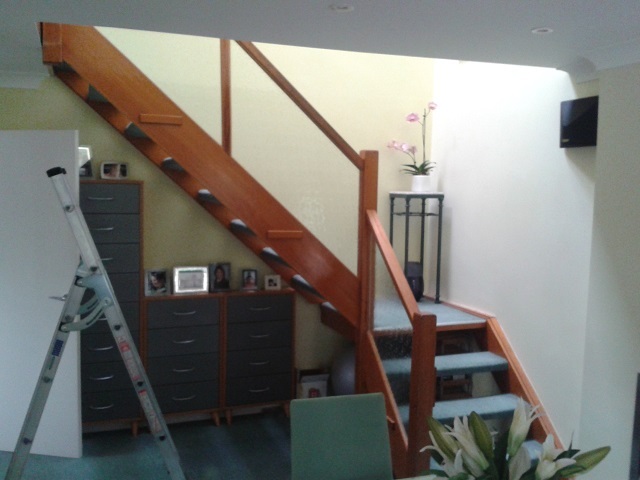 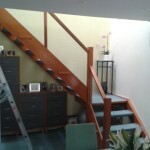 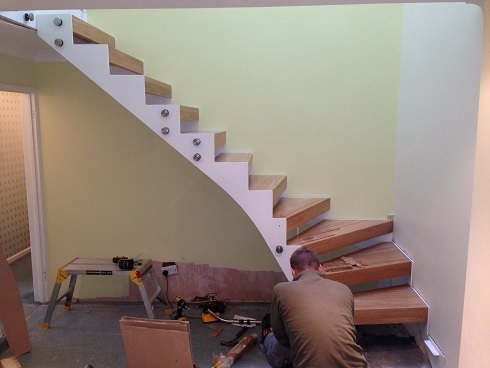 A Modern Staircase was installed last week in Farnborough, Hampshire. 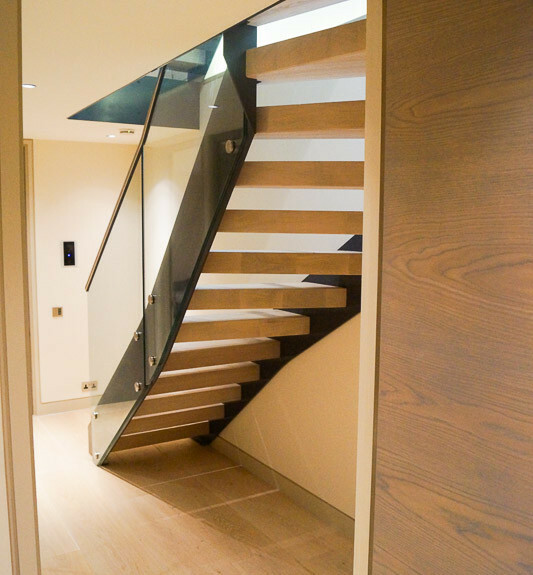 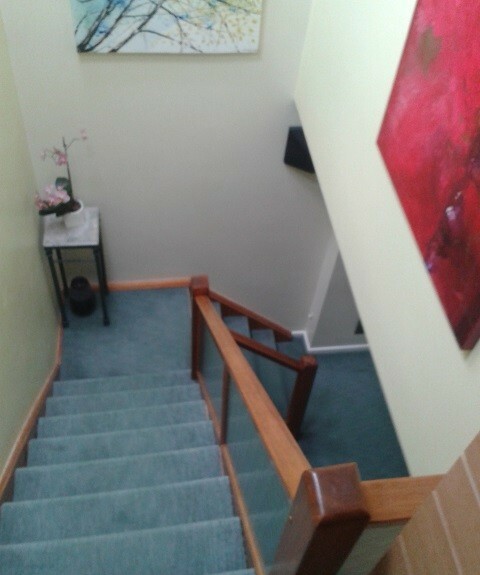 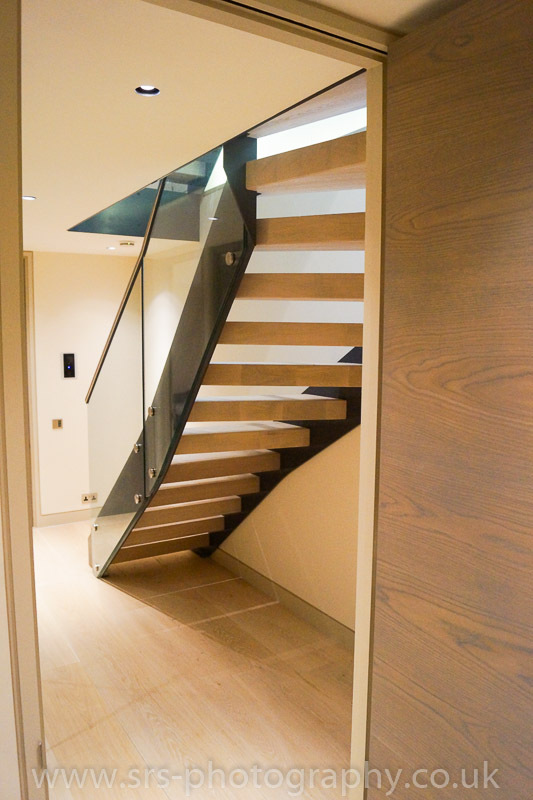 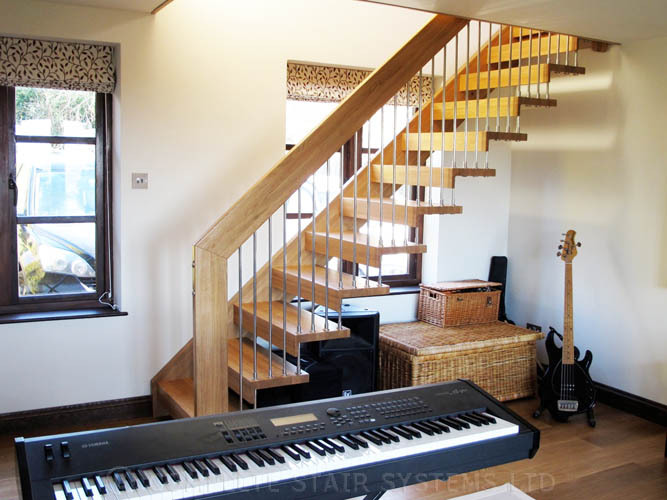 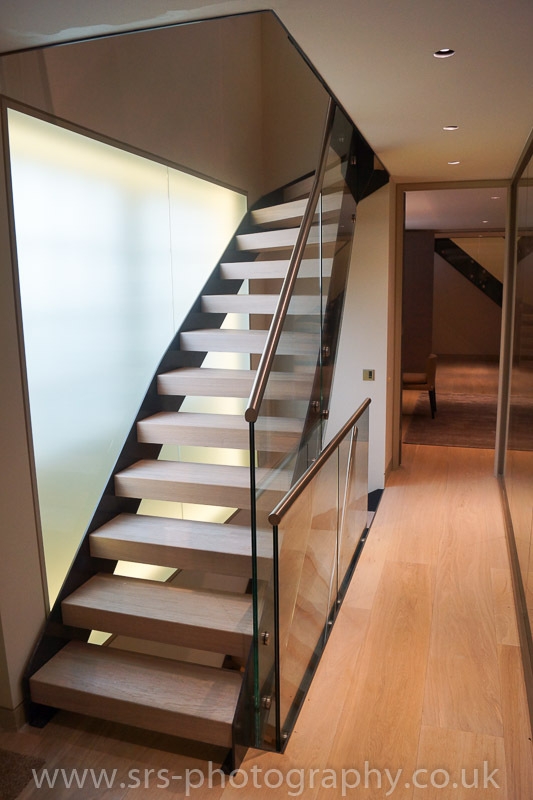 As part of a refurbishment, our client needed their current carpeted quarter turn staircase replaced with a stunning modern staircase, offering light and space. 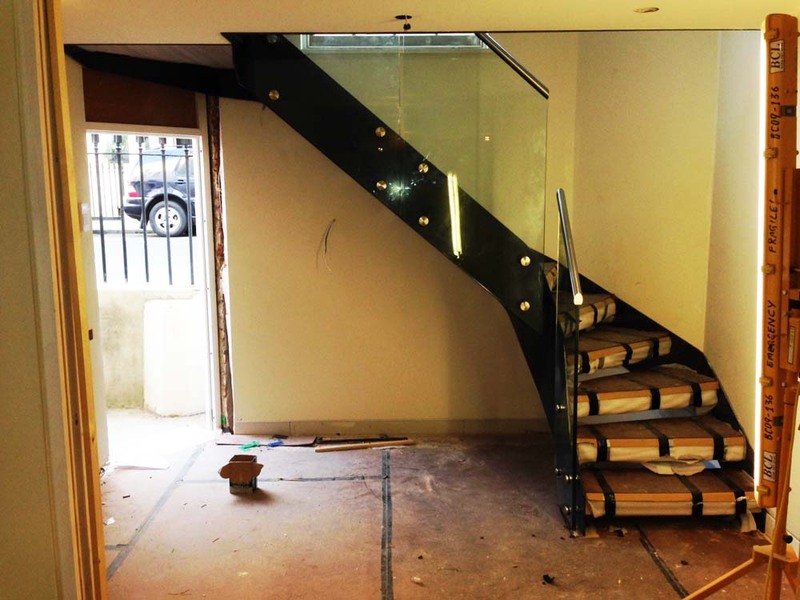 Instead of maintaining the existing square platform at the turn we introduced winding treads which saved a little space, created an nice angle to the stringers and actually increased the depth of the individual treads – making the flight easier to ascend. 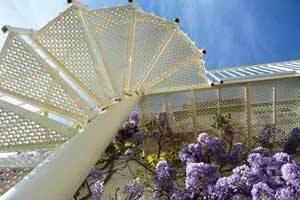 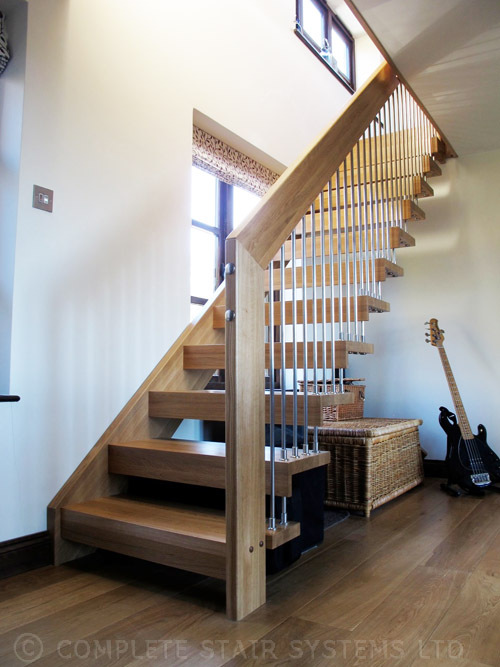 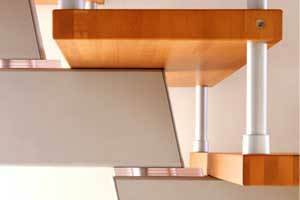 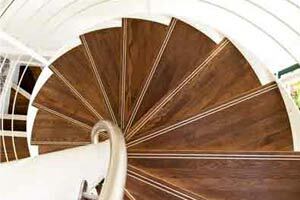 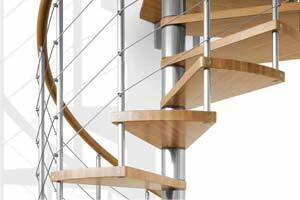 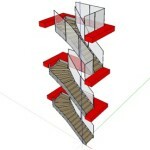 The model 500 modern staircase was selected with steel laser cut stringer and solid oak treads. 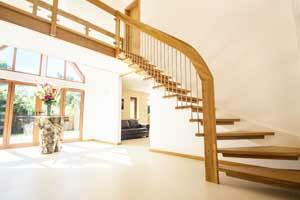 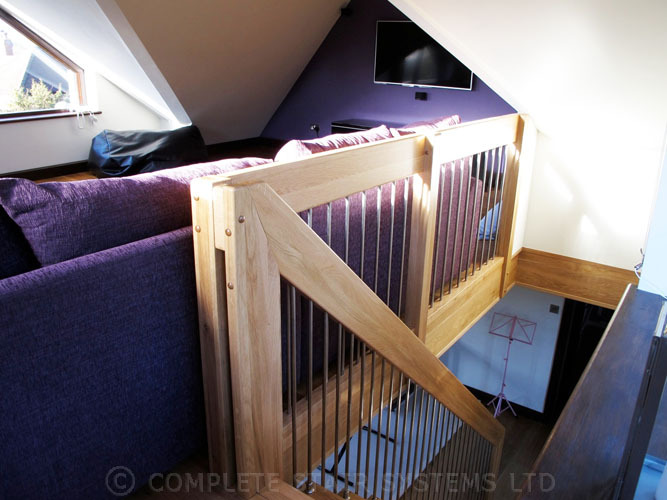 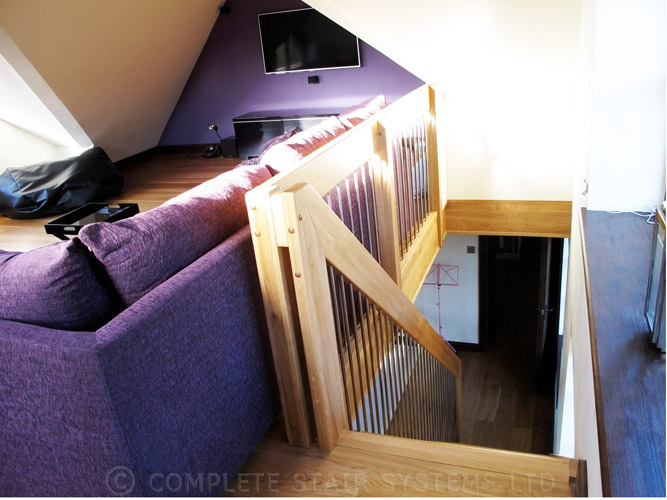 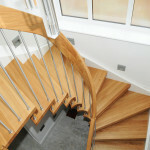 The oak treads had an integrated downstand at the front to ensure it met building regulations. 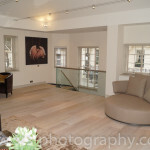 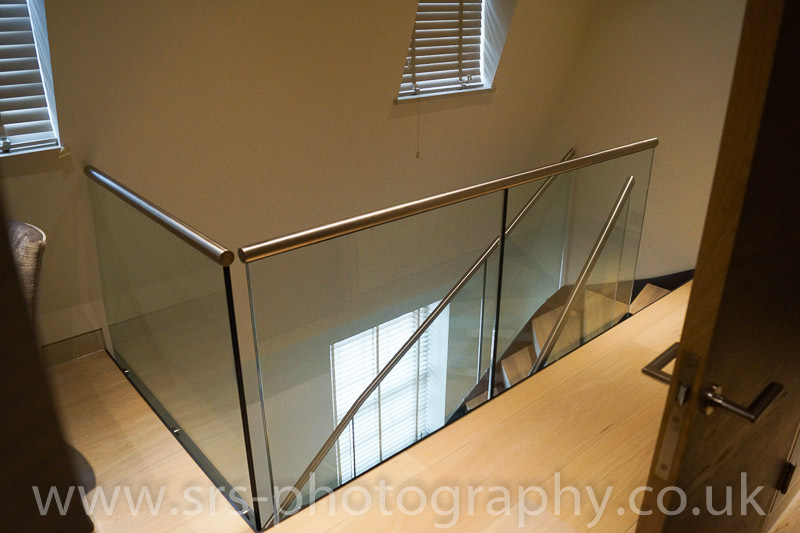 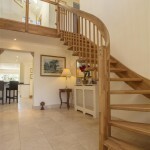 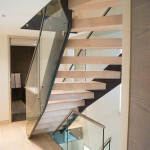 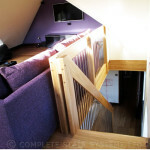 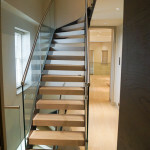 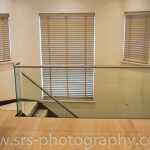 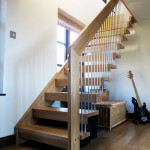 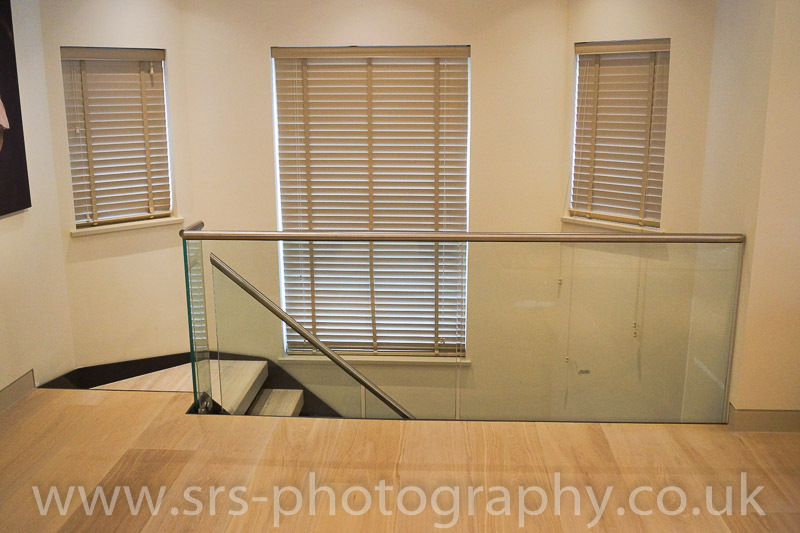 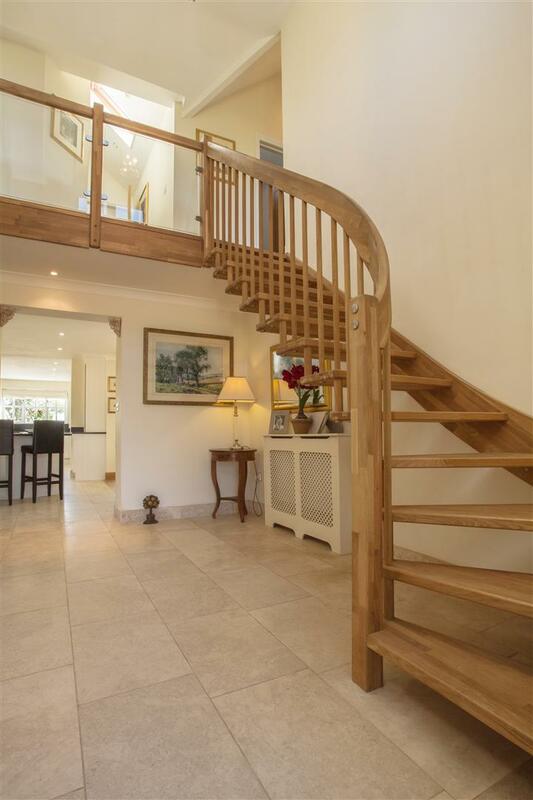 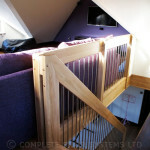 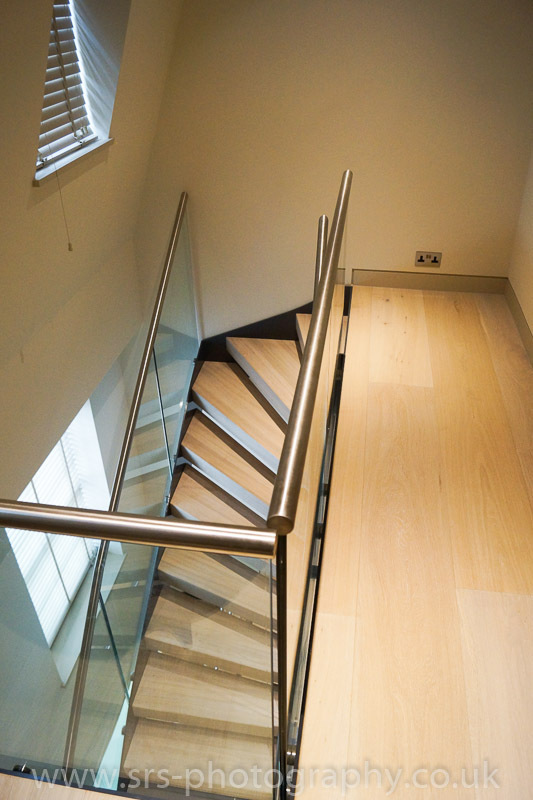 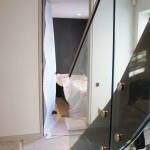 Frameless glass balustrade was supplied down the internal side and this was topped with an oak handrail. 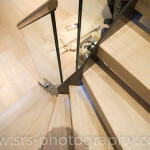 The final floor is to be laid in a couple of weeks and we will be back to take some finished pictures then. 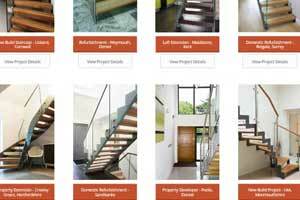 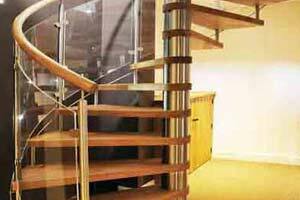 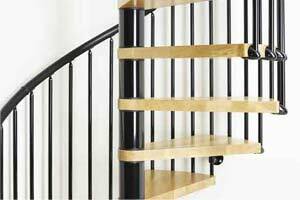 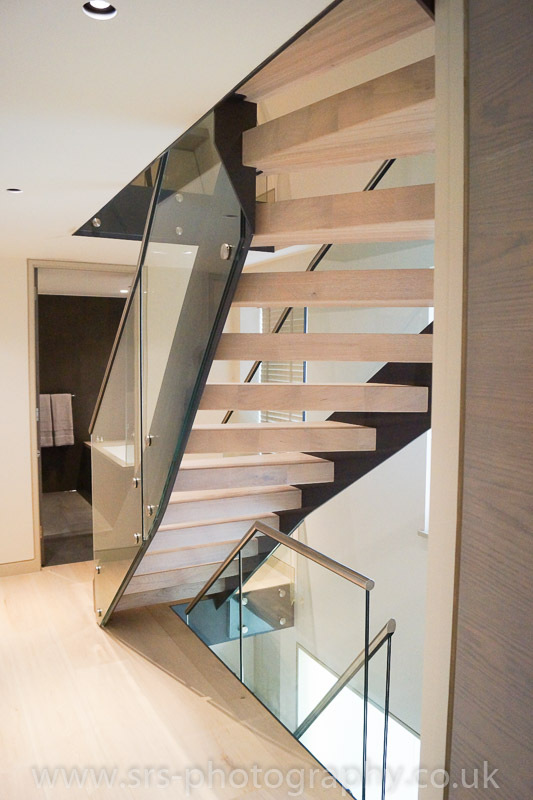 In the meantime if you are looking for a similar modern staircase – please call us on 01794 522444 or email info@completestairsystems.co.uk. 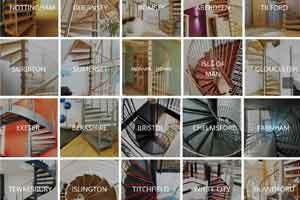 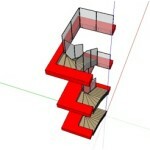 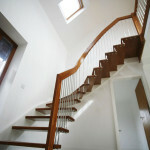 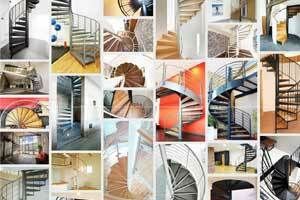 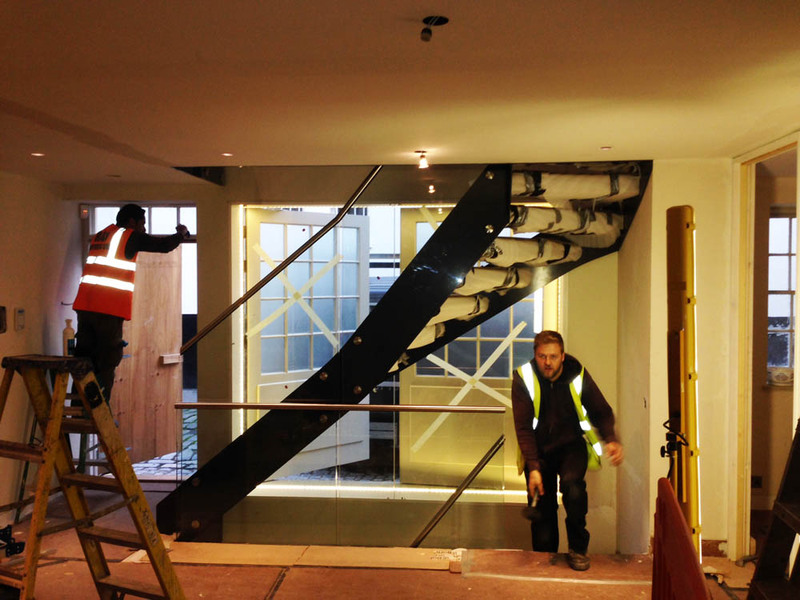 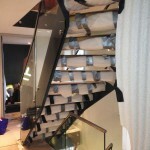 A few ‘just installed’ pictures of a project of 4 x model 500 bespoke staircases in central London. 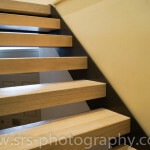 I took these on a visit earlier this week after a pig of a drive! 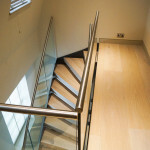 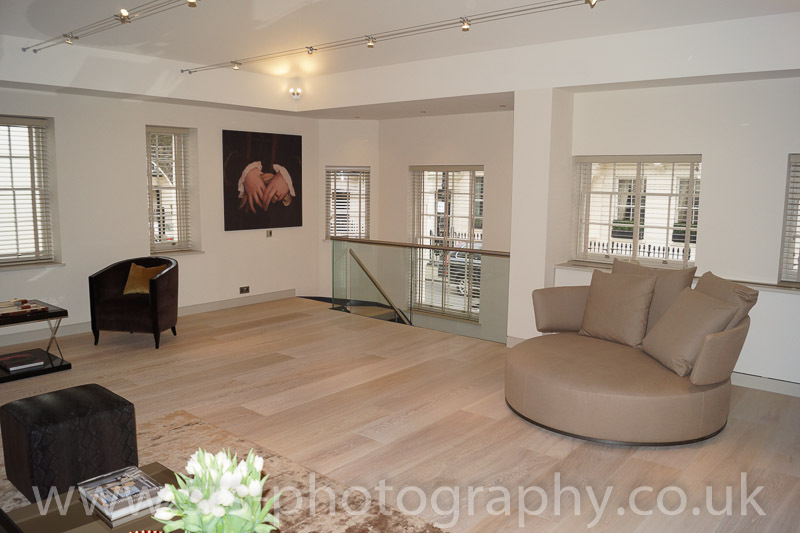 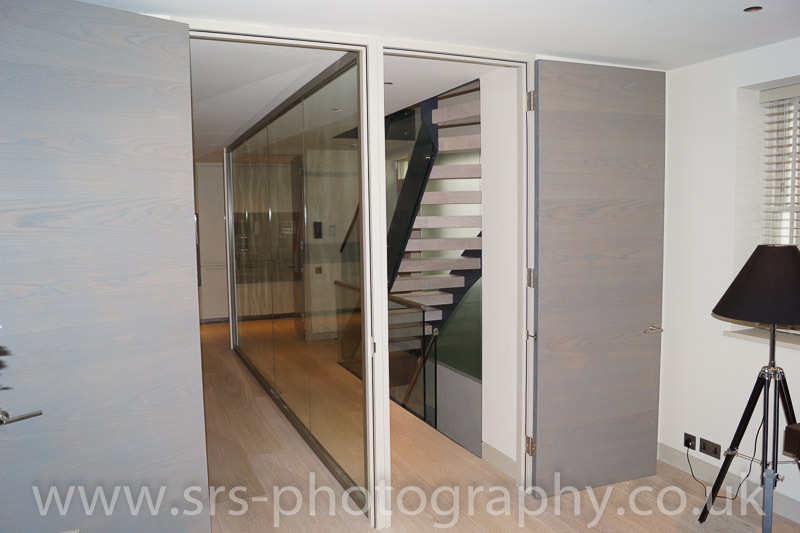 All 4 flights were supplied for the one dwelling in Belgravia, and a stunning dwelling it is too! 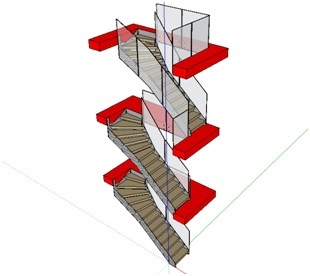 We had three 3 quarter turn staircases directly one above another connecting ground to first to second floors. 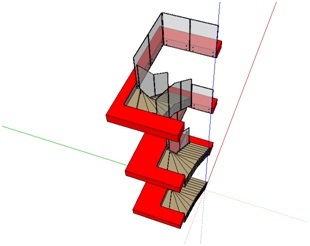 The forth flight was a half turn connecting the ground and first floors towards the front of property. 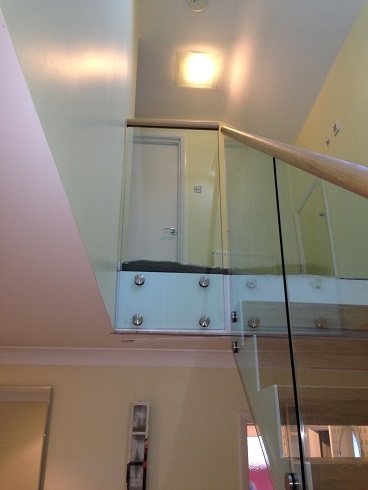 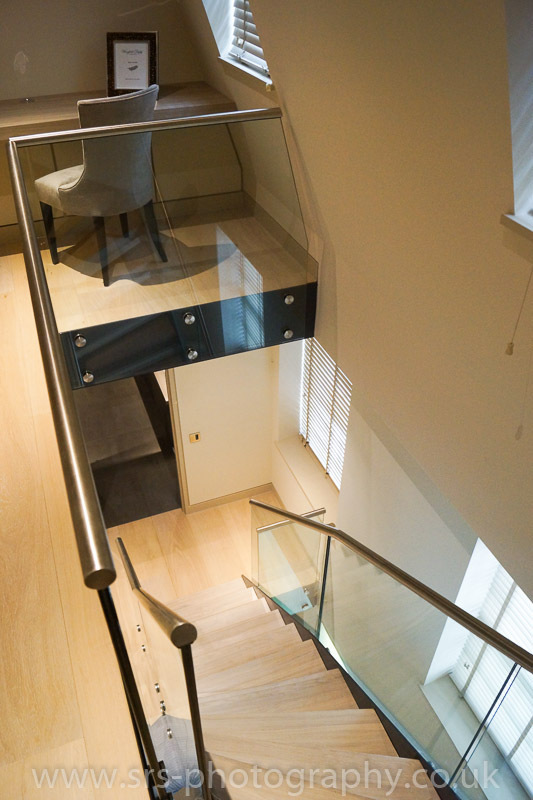 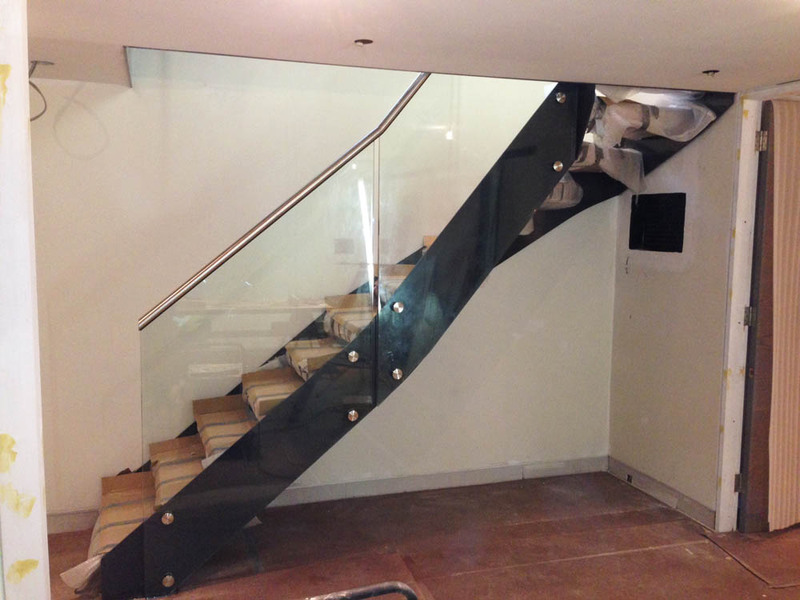 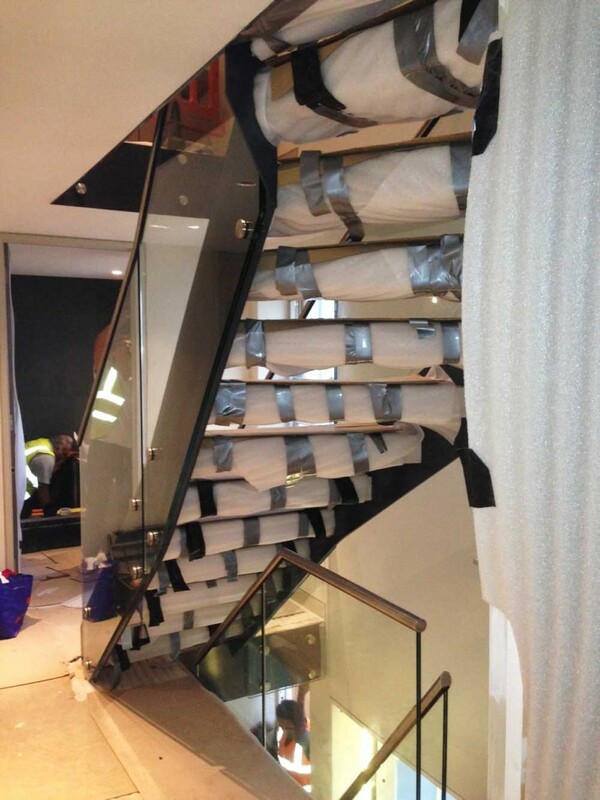 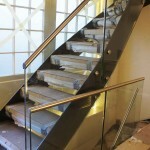 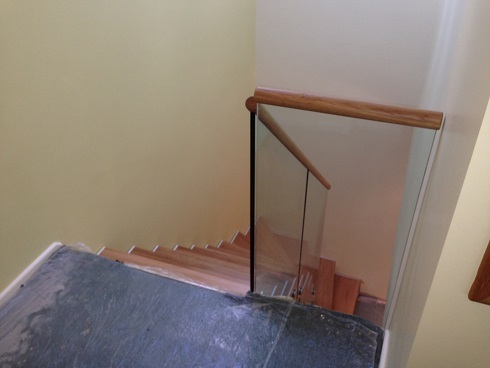 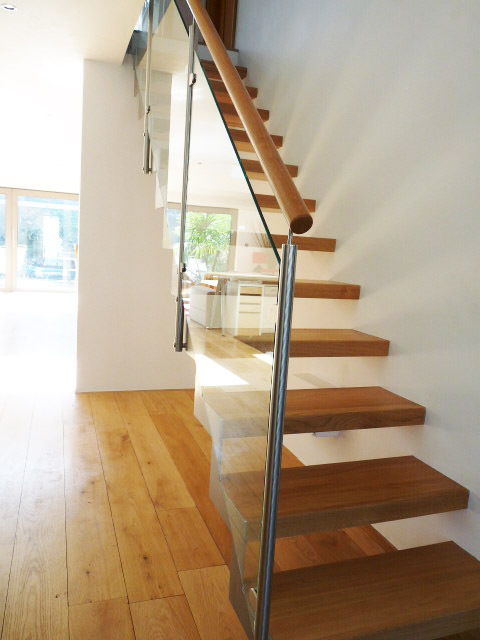 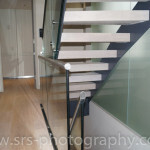 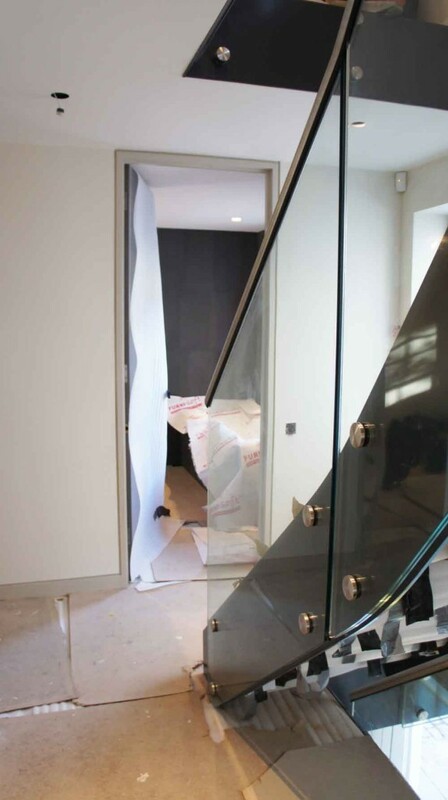 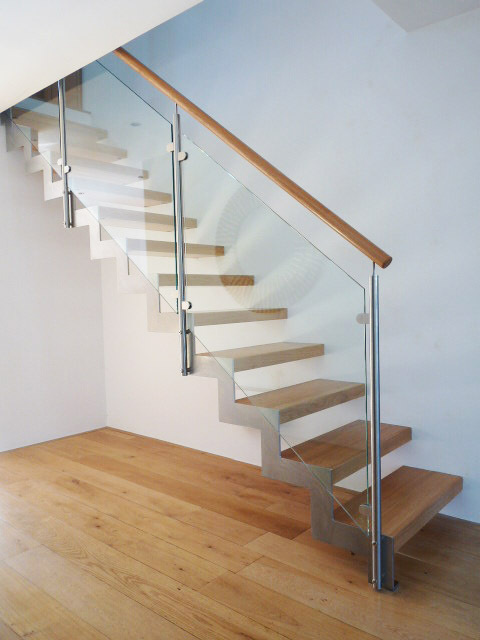 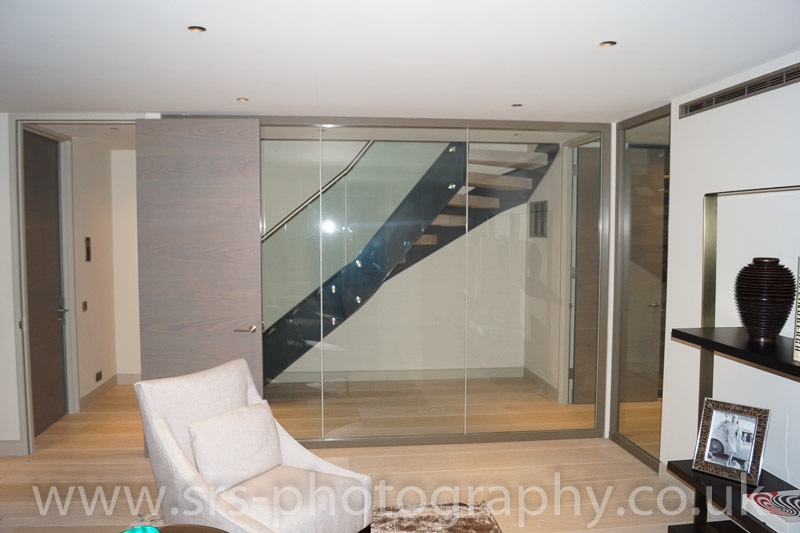 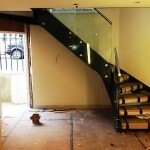 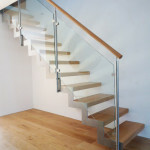 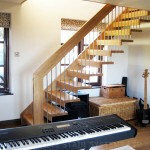 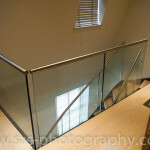 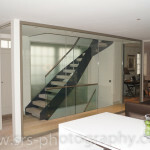 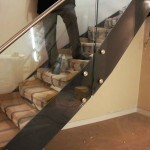 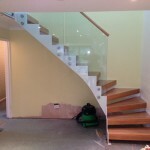 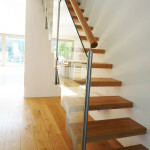 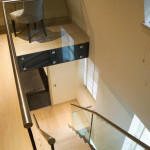 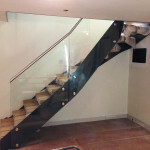 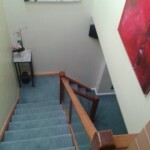 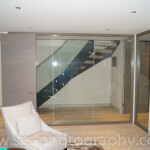 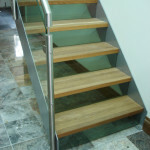 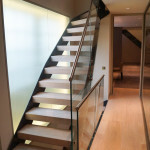 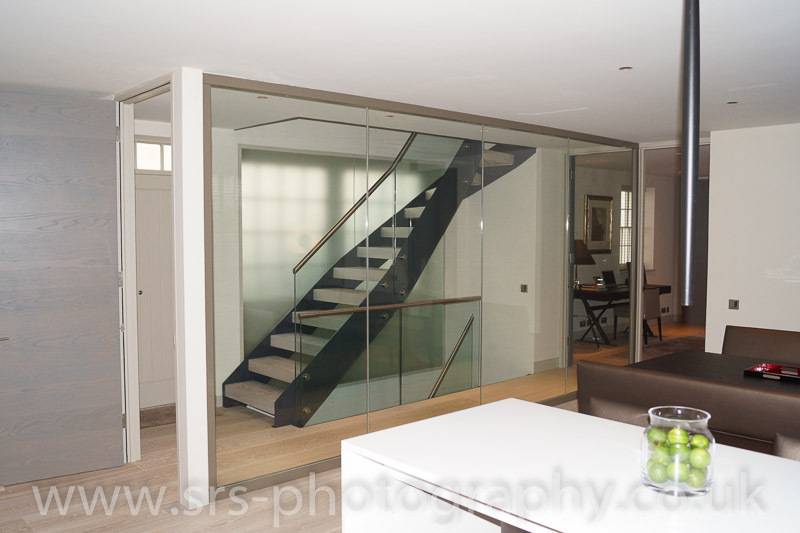 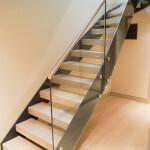 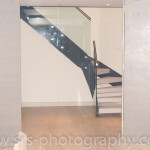 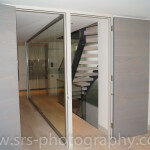 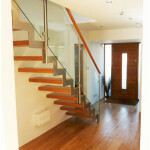 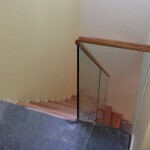 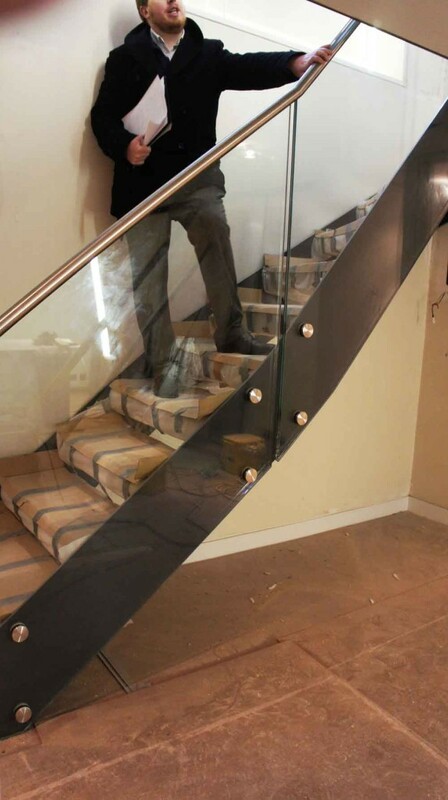 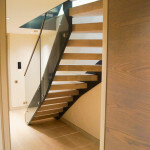 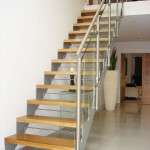 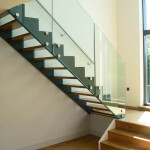 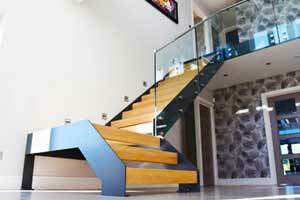 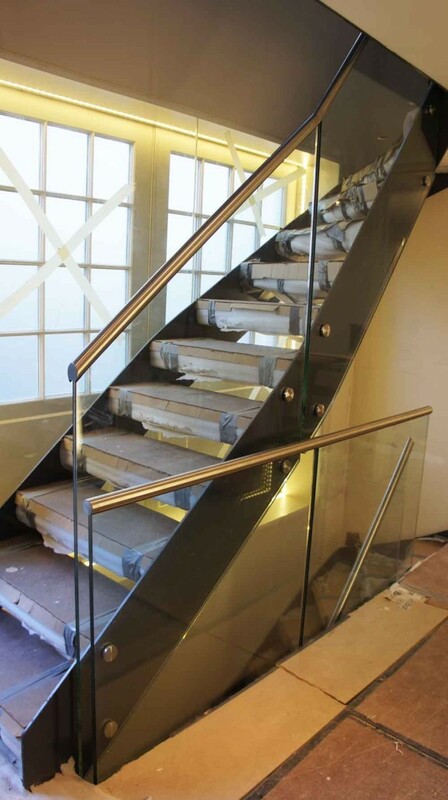 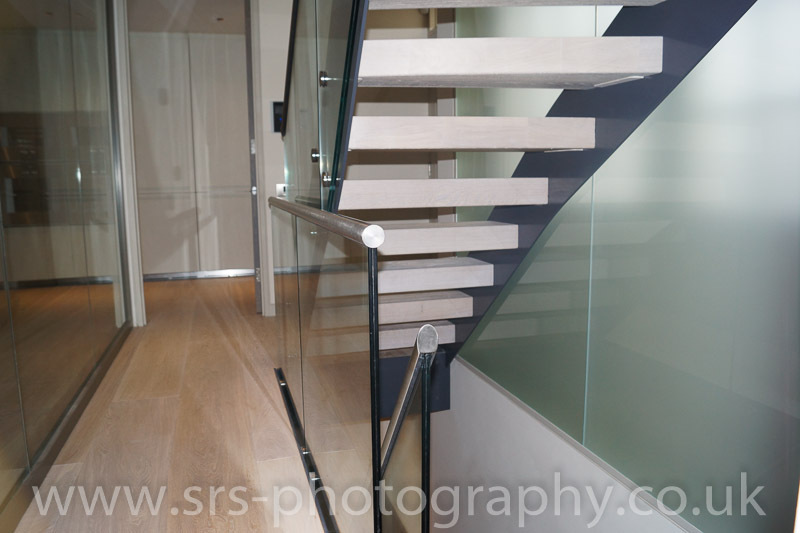 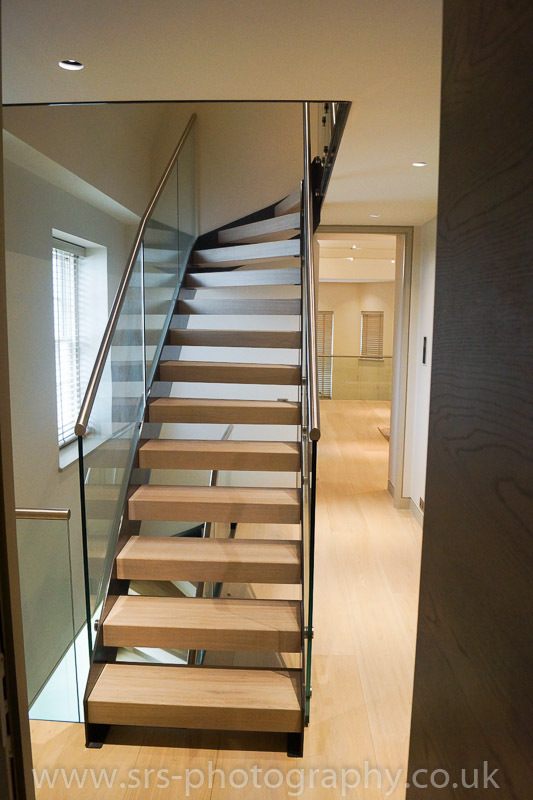 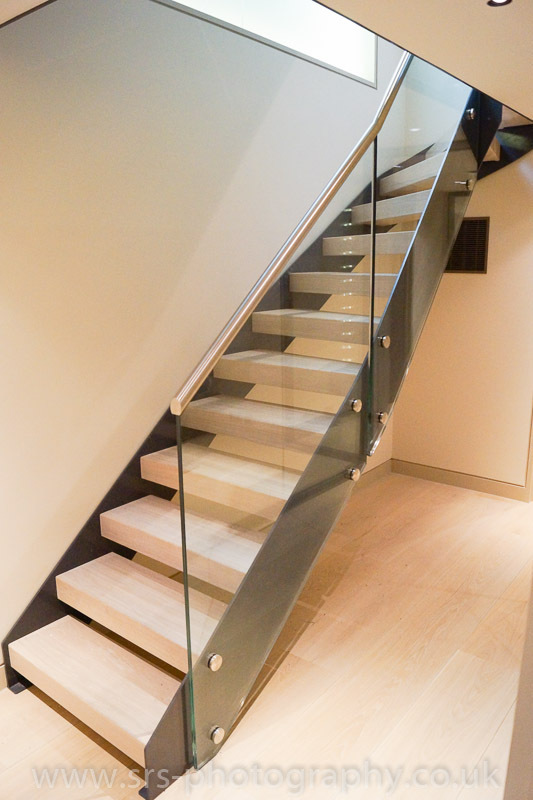 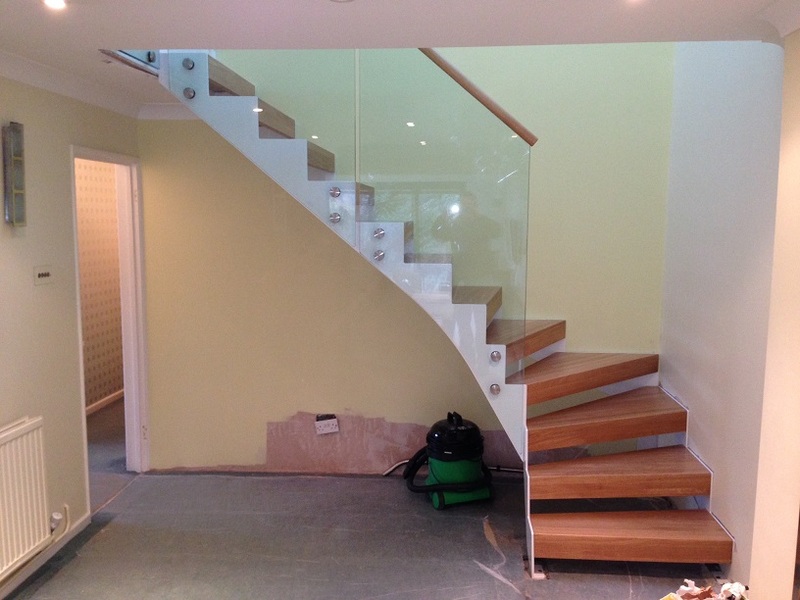 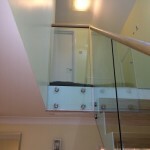 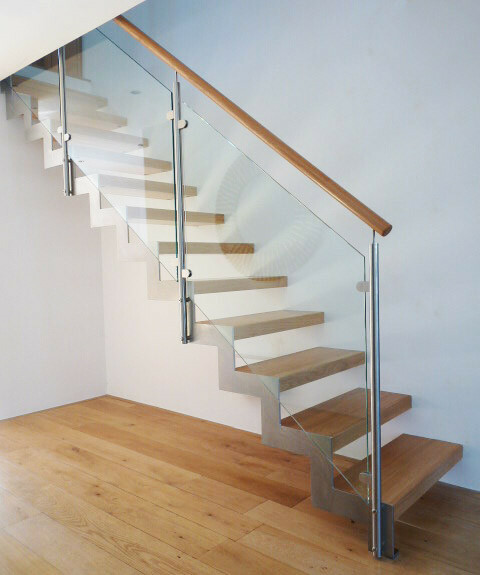 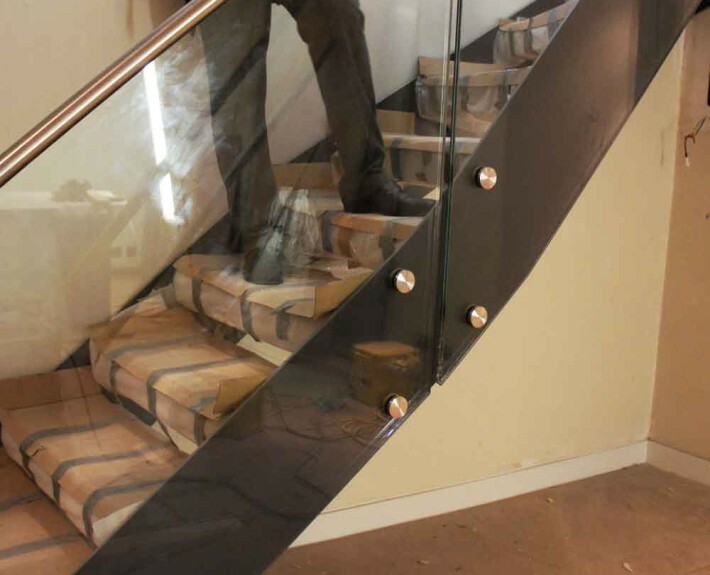 Frameless glass balustrade was supplied and fitted to all staircases and across the landing levels. 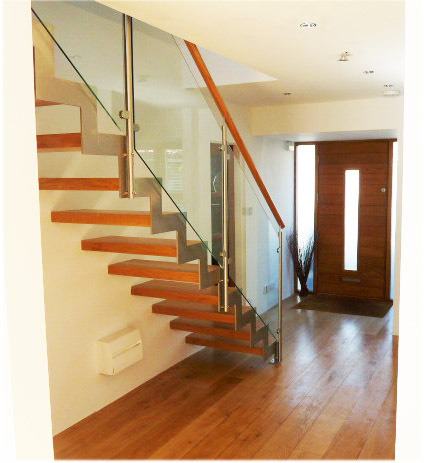 Currently protected whilst the build completes are the 100mm solid Oak treads – with a white wax finish. 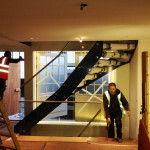 I cant wait to see the finished pictures of ‘staircase london’ – stay posted.